"Sleeping sickness" and "Sleep fever" redirect here. For other uses, see Sleeping sickness (disambiguation). African trypanosomiasis, also known as sleeping sickness, is an insect-borne parasitic disease of humans and other animals. It is caused by protozoa of the species Trypanosoma brucei. There are two types that infect humans, Trypanosoma brucei gambiense (TbG) and Trypanosoma brucei rhodesiense (TbR). TbG causes over 98% of reported cases. Both are usually transmitted by the bite of an infected tsetse fly and are most common in rural areas. Initially, in the first stage of the disease, there are fevers, headaches, itchiness and joint pains. This begins one to three weeks after the bite. Weeks to months later the second stage begins with confusion, poor coordination, numbness, and trouble sleeping. Diagnosis is via finding the parasite in a blood smear or in the fluid of a lymph node. A lumbar puncture is often needed to tell the difference between first and second stage disease. Prevention of severe disease involves screening the population at risk with blood tests for TbG. Treatment is easier when the disease is detected early and before neurological symptoms occur. Treatment of the first stage is with the medications pentamidine or suramin. Treatment of the second stage involves eflornithine or a combination of nifurtimox and eflornithine for TbG. While melarsoprol works for both stages, it is typically only used for TbR, due to serious side effects. Without treatment it typically results in death. The disease occurs regularly in some regions of sub-Saharan Africa with the population at risk being about 70 million in 36 countries. An estimated 11,000 people are currently infected with 2,800 new infections in 2015. In 2015 it caused around 3,500 deaths, down from 34,000 in 1990. More than 80% of these cases are in the Democratic Republic of the Congo. Three major outbreaks have occurred in recent history: one from 1896 to 1906 primarily in Uganda and the Congo Basin and two in 1920 and 1970 in several African countries. It is classified as a neglected tropical disease. Other animals, such as cows, may carry the disease and become infected in which case it is known as animal trypanosomiasis. As of 2010 it caused around 9,000 deaths, down from 34,000 in 1990. As of 2000, the disability-adjusted life-years (9 to 10 years) lost due to sleeping sickness are 2.0 million. From 2010-2014, there was an estimated 55 million people at risk for gambiense African Trypanosomiasis and over 6 million people at risk for rhodesiense African Trypanosomiasis. In 2014, the World Health Organization reported 3,797 cases of Human African Trypanosomiasis when the predicted number of cases were to be 5,000. The number of total reported cases in 2014 is an 86% reduction to the total number of cases reported in 2000. The disease has been recorded as occurring in 37 countries, all in sub-Saharan Africa. It occurs regularly in southeast Uganda and western Kenya, and killed more than 48,000 Africans in 2008. The Democratic Republic of the Congo is the most affected country in the world, accounting for 75% of the Trypanosoma brucei gambiense cases. The population at risk being about 69 million with one third of this number being at a 'very high' to 'moderate' risk and the remaining two thirds at a 'low' to 'very low' risk. The number of people being affected by the disease has declined. At this rate, sleeping sickness elimination is a possibility. The World Health Organization plans to eradicate sleeping sickness by the year 2020. The condition has been present in Africa for thousands of years. Because of a lack of travel between indigenous people, sleeping sickness in humans had been limited to isolated pockets. This changed after Arab slave traders entered central Africa from the east, following the Congo River, bringing parasites along. Gambian sleeping sickness travelled up the Congo River, and then further east. The causative agent and vector were identified in 1903 by David Bruce, and the subspecies of the protozoa were differentiated in 1910. Bruce had earlier shown that T. brucei was the cause of a similar disease in horses and cattle that was transmitted by the tse-tse fly (Glossina morsitans). Pentamidine, a highly effective drug for the first stage of the disease, has been used since 1937. During the 1950s, it was widely used as a prophylactic agent in western Africa, leading to a sharp decline in infection rates. At the time, eradication of the disease was thought to be at hand. Recent findings indicate that the parasite is unable to survive in the bloodstream without its flagellum. This insight gives researchers a new angle with which to attack the parasite. Additionally, the Drugs for Neglected Disease Initiative has contributed to the African sleeping sickness research effort by developing a compound called fexinidazole. This project was originally started in April 2007 and is currently in a pivotal study in clinical phase II/III. The goal is to have the drug succeed and be proven effective against stage one and stage two HAT caused by T. b. gambiense, as well as HAT caused by T. b. rhodesiense. Tentative evidence supports fexinidazole. The European Medicines Agency approved it for first and second stage disease outside of Europe. For sleeping sickness, funding was split into basic research, drug discovery, vaccines, and diagnostics. The greatest amount of funding was directed towards basic research of the disease; approximately $21.6 million US dollars was directed towards that effort. As for therapeutic development, approximately $10.9 million was invested. For kinetoplastid infections specifically, they have donated an average of $28.15 million US dollars annually between the years 2007 to 2011. They have labeled human African trypanosomiasis a high-opportunity target meaning it is a disease that presents the greatest opportunity for control, elimination, and eradication, through the development of new drugs, vaccines, public-health programs, and diagnostics. They are the second highest funding source for neglected diseases, immediately behind the US National Institutes of Health. At a time where public funding is decreasing and government grants for scientific research are harder to obtain, the philanthropic world has stepped in to push the research forward. Trypanosoma of both the rhodesiense and gambiense types can affect other animals such as cattle and wild animals. ^ a b c d e f g h i j k l m n o p q r s t u v WHO Media centre (March 2014). "Fact sheet N°259: Trypanosomiasis, Human African (sleeping sickness)". World Health Organization. Archived from the original on 26 April 2014. Retrieved 25 April 2014. ^ a b c d e f g h i j k l m Kennedy, PG (February 2013). "Clinical features, diagnosis and treatment of human African trypanosomiasis (sleeping sickness)". Lancet Neurology. 12 (2): 186–94. doi:10.1016/S1474-4422(12)70296-X. PMID 23260189. ^ a b GBD 2015 Disease and Injury Incidence and Prevalence, Collaborators. (8 October 2016). "Global, regional, and national incidence, prevalence and years lived with disability for 310 diseases and injuries, 1990-2015: a systematic analysis for the Global Burden of Disease Study 2015". Lancet. 388 (10053): 1545–1602. doi:10.1016/S0140-6736(16)31678-6. PMC 5055577. PMID 27733282. ^ a b GBD 2015 Mortality and Causes of Death, Collaborators. (8 October 2016). "Global, regional, and national life expectancy, all-cause mortality and cause-specific mortality for 249 causes of death, 1980-2015: a systematic analysis for the Global Burden of Disease Study 2015". Lancet. 388 (10053): 1459–1544. doi:10.1016/s0140-6736(16)31012-1. PMC 5388903. PMID 27733281. ^ a b Simarro PP, Cecchi G, Franco JR, et al. (2012). "Estimating and mapping the population at risk of sleeping sickness". PLOS Negl Trop Dis. 6 (10): e1859. doi:10.1371/journal.pntd.0001859. PMC 3493382. PMID 23145192. ^ a b Lozano, R (15 December 2012). "Global and regional mortality from 235 causes of death for 20 age groups in 1990 and 2010: a systematic analysis for the Global Burden of Disease Study 2010". Lancet. 380 (9859): 2095–128. doi:10.1016/S0140-6736(12)61728-0. PMID 23245604. ^ a b GB Lundkvist; K Kristensson; M Bentivoglio (August 2004). "Why trypanosomes cause sleeping sickness". Physiology. 19 (4): 198–206. doi:10.1152/physiol.00006.2004. PMID 15304634. ^ a b c d e Brun R, Blum J, Chappuis F, Burri C (January 2010). "Human African trypanosomiasis". Lancet. 375 (9709): 148–59. doi:10.1016/S0140-6736(09)60829-1. PMID 19833383. ^ "East African Trypanosomiasis FAQs". 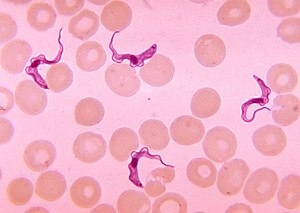 Parasites — African Trypanosomiasis (also known as Sleeping Sickness). Centers for Disease Control and Prevention. 29 August 2012. Archived from the original on 11 July 2017. ^ "West African Trypanosomiasis FAQs". Parasites – African Trypanosomiasis (also known as Sleeping Sickness). Centers for Disease Control and Prevention. 29 August 2012. Archived from the original on 19 June 2017. ^ a b "Uganda: Sleeping Sickness Reaching Alarming Levels". New Vision. 11 May 2008. Archived from the original on 21 May 2008. ^ a b Franco, J.R. (2014). "Epidemiology of human African trypanosomiasis". Clinical Epidemiology. 6: 257–275. doi:10.2147/CLEP.S39728. PMC 4130665. PMID 25125985. ^ a b Franco, J.R. (2014). "Epidemiology of human African trypanosomiasis". Clinical Epidemiology. 6: 257–275. ^ Olowe SA (1975). "A case of congenital trypanosomiasis in Lagos". Trans. R. Soc. Trop. Med. Hyg. 69 (1): 57–9. doi:10.1016/0035-9203(75)90011-5. PMID 1170654. ^ a b Rocha G, Martins A, Gama G, Brandão F, Atouguia J (January 2004). "Possible cases of sexual and congenital transmission of sleeping sickness". Lancet. 363 (9404): 247. doi:10.1016/S0140-6736(03)15345-7. PMID 14738812. ^ Cherenet T, Sani RA, Panandam JM, Nadzr S, Speybroeck N, van den Bossche P (December 2004). "Seasonal prevalence of bovine trypanosomosis in a tsetse-infested zone and a tsetse-free zone of the Amhara Region, north-west Ethiopia". Onderstepoort J. Vet. Res. 71 (4): 307–12. doi:10.4102/ojvr.v71i4.250. PMID 15732457. ^ Cornford, E M; Bocash, W D; Braun, L D; Crane, P D; Oldendorf, W H; MacInnis, A J (1979). "Rapid distribution of tryptophol (3-indole ethanol) to the brain and other tissues". Journal of Clinical Investigation. 63 (6): 1241–8. doi:10.1172/JCI109419. PMC 372073. PMID 447842. ^ Truc P; Lejon V; Magnus E; et al. (2002). "Evaluation of the micro-CATT, CATT/Trypanosoma brucei gambiense, and LATEX/T b gambiense methods for serodiagnosis and surveillance of human African trypanosomiasis in West and Central Africa". Bull. World Health Organ. 80 (11): 882–6. PMC 2567684. PMID 12481210. Archived from the original on 19 September 2011. Retrieved 16 March 2009. ^ Schofield CJ, Kabayo JP (2008). "Trypanosomiasis vector control in Africa and Latin America". Parasit Vectors. 1 (1): 24. doi:10.1186/1756-3305-1-24. PMC 2526077. PMID 18673535. Archived from the original on 30 August 2014. ^ "Strategic Direction for African Trypanosomiasis Research". Special Programme for Research and Training in Tropical Diseases. Archived from the original on 22 March 2006. Retrieved 1 March 2006. ^ a b c Lutje, V; Seixas, J; Kennedy, A (28 June 2013). "Chemotherapy for second-stage human African trypanosomiasis" (PDF). The Cochrane Database of Systematic Reviews. 6 (6): CD006201. doi:10.1002/14651858.CD006201.pub3. PMID 23807762. ^ WHO mortality and health data and statistics Archived 16 January 2013 at the Wayback Machine, accessed 10 February 2009. ^ a b Franco, J. A. R. (2017). "Monitoring the elimination of human African trypanosomiasis: Update to 2014". PLOS Neglected Tropical Diseases. 11. ^ Franco, J. A. R. (2017). "Monitoring the elimination of human African trypanosomiasis: Update to 2014". PLOS Neglected Tropical Diseases. 11. ^ "Number of new reported cases (T.b. gambiense)". World Health Organization. 15 September 2017. Retrieved 25 July 2018. ^ "Number of new reported cases (T.b. rhodesiense)". World Health Organization. 15 September 2017. Retrieved 25 July 2018. ^ "Trypanosomiasis, human African (sleeping sickness)". World Health Organization. March 2014. Archived from the original on 26 April 2014. ^ Steverding, D (12 February 2008). "The history of African trypanosomiasis". Parasites & Vectors. 1 (1): 3. doi:10.1186/1756-3305-1-3. PMC 2270819. PMID 18275594. ^ a b c d Strong, Richard P (1944). Stitt's Diagnosis, Prevention and Treatment of Tropical Diseases (Seventh ed.). York, PA: The Blakiston company. p. 165. ^ Fèvre EM, Coleman PG, Welburn SC, Maudlin I (April 2004). "Reanalyzing the 1900–1920 sleeping sickness epidemic in Uganda". Emerging Infect. Dis. 10 (4): 567–73. doi:10.3201/eid1004.020626. PMID 15200843. Archived from the original on 29 June 2011. ^ Fage, John D. (5 September 1985). The Cambridge History of Africa: From the earliest times to c. 500 BC. Cambridge University Press. p. 748. ISBN 978-0-521-22803-9. Archived from the original on 18 March 2015. ^ Steverding, Dietmar (2010). "The development of drugs for treatment of sleeping sickness: a historical review". Parasites & Vectors. 3 (1): 15. doi:10.1186/1756-3305-3-15. PMC 2848007. PMID 20219092. Archived from the original on 18 October 2014. Retrieved 14 October 2014. ^ Klingman, Jack (1994). "Arthur Lewis Piper, M.D. : A Medical Missionary in the Belgian Congo". Journal of Community Health. 19 (2). Periodicals Archive Online accessed 15 October 2013. ^ Magill, Alan J.; Strickland, G. Thomas; Maguire, James H.; Ryan, Edward T.; Solomon, Tom (2012). Hunter's Tropical Medicine and Emerging Infectious Disease (9 ed.). Elsevier Health Sciences. p. 723. ISBN 978-1455740437. ^ Urban Hellgren; Orjan Ericsson; Yakoub AdenAbdi; Lars L Gustafsson (20 May 2003). Handbook of Drugs for Tropical Parasitic Infections. p. 60. ISBN 9780203211519. ^ a b Robinson, Victor, ed. (1939). "African Lethargy, Sleeping Sickness, or Congo trypanosomiasis; Trypanosoma gambiense". The Modern Home Physician, A New Encyclopedia of Medical Knowledge. WM. H. Wise & Company (New York). , pp. 20–21. ^ Strong, Richard P (1944). Stitt's Diagnosis, Prevention and Treatment of Tropical Diseases (Seventh ed.). York, PA: The Blakiston company. p. 164. ^ Berriman M; Ghedin E; Hertz-Fowler C; et al. (2005). "The genome of the African trypanosome Trypanosoma brucei". Science. 309 (5733): 416–22. Bibcode:2005Sci...309..416B. doi:10.1126/science.1112642. PMID 16020726. Archived from the original on 23 February 2006. ^ Doudoumis V, Alam U, Aksoy E, et al. (March 2013). "Tsetse-Wolbachia symbiosis: comes of age and has great potential for pest and disease control". J. Invertebr. Pathol. 112 (Suppl): S94–103. doi:10.1016/j.jip.2012.05.010. PMC 3772542. PMID 22835476. ^ "African Sleeping Sickness Breakthrough". Archived from the original on 13 May 2006. Retrieved 7 April 2006. ^ "Fexinidazole". Drugs for Neglected Disease Initiative. October 2013. Archived from the original on 28 April 2014. ^ DNDi (4 November 2017). "Phase II/III studies show high efficacy and safety of fexinidazole, the first oral treatment for sleeping sickness". dndi.org. Retrieved 20 November 2018. ^ "CHMP Summary of Opinion - Fexinidazole Winthrop" (PDF). Retrieved 19 November 2018. ^ a b c d e f g h i Moran, M.; Guzman, J.; Chapman, N.; Abela-Oversteengen, L.; Howard, R.; Farrell, P.; Luxford, J. "Neglected Disease Research and Development: The Public Divide" (PDF). Global Funding of Innovation for Neglected Disease. Archived (PDF) from the original on 1 April 2016. Retrieved 30 October 2016. ^ "Strategy Overview". Neglected Infectious Diseases. Bill and Melinda Gates Foundation. 2013. Archived from the original on 1 November 2015. ^ "Background Paper 8: 8.1 Public-Private Partnerships and Innovation" (PDF). Priority Medicines for Europe and the World Update Report. World Health Organization. 2013. Archived from the original on 20 August 2014. "Sleeping sickness". Médecins Sans Frontières. Archived from the original on 23 October 2013.